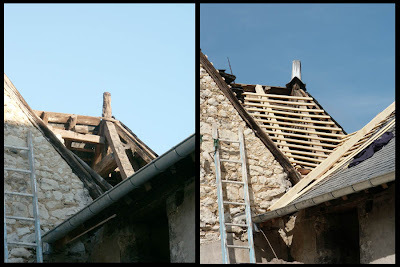 Our new friend Bengt, who lives in Sweeden but has a house in Preuilly took these photos on Friday. Bengt occasionally comments on the blog - which is where he discovered we exist. We met him the day before we left Preuilly last time - the day he arrived after a 17 hour journey. After 30 minutes of trying to manouver the big green machine though the gates and into place, I graciously allow the roofers to demolish the fence. This saves me a job in the future. 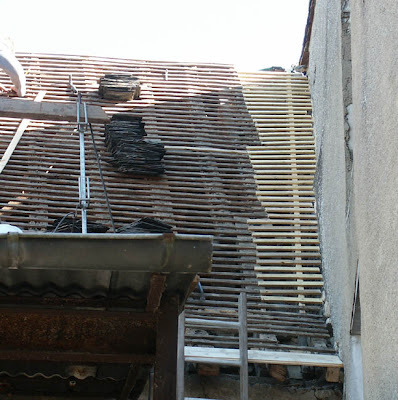 With the tiles and battens removed, it is easy to see how "in the rough" some of the roof is. 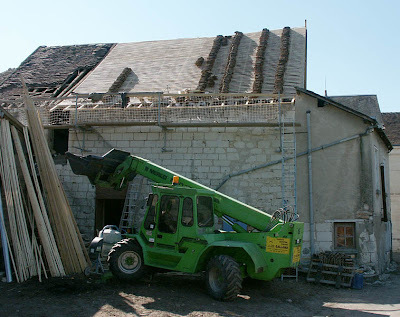 Chocks are placed under the roof braces so that they are somewhat level. 8 days in. 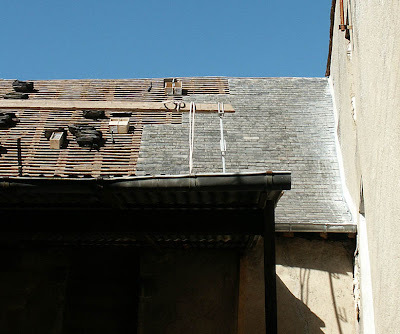 most of the slates are replaced, and the sheeting is off the "hangar". The frame of the hangar is being cut down. The Hangar has gone and demolition of the first chimney starts. 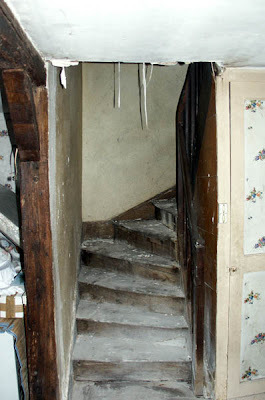 The area over the stairs is finished. 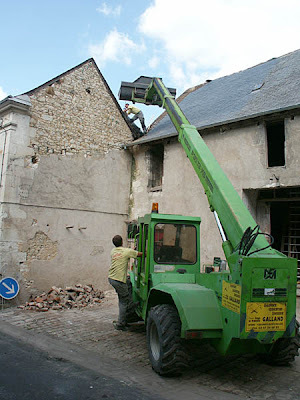 The second chimney is demolished. 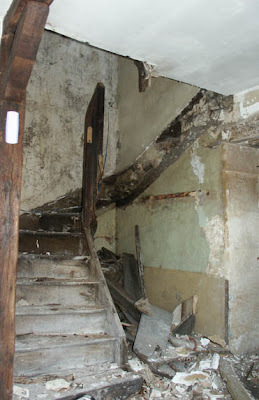 On Sunday we had a visit from a nearly local architect who we are thinking of employing. While he was with us he asked what was under the concrete hatch behind the house. Surprisingly, we didn't know. We had always assumed that it was something to do with sewerage or drainage or something yucky. The architect, however, is made of sterner stuff. 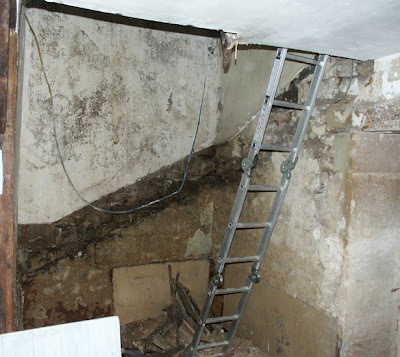 He lifted the hatch to find........ a stone lined well, complete with water about 18 metres down. This is exciting, and news to us, even if we do suspect that we are the only people in town who didn't know it was there somewhere. 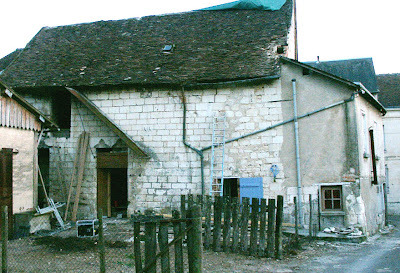 M. Chaboisson came to quote for the new staircase and some windows. We were discussing a new front window and Susan and my ideas, when M. Chaboisson shook his head and said "ce n'est pas joli". Which is the equivalent of an Australian builder saying "No mate - that wouldn't be pretty"
On Monday evening I'd had enough of sitting in the gloom, dirty and cold, so I booked myself a night at l'Image. After the mother of all baths I had dinner in the restaurant, and then I had a chat about stuff with Christophe. 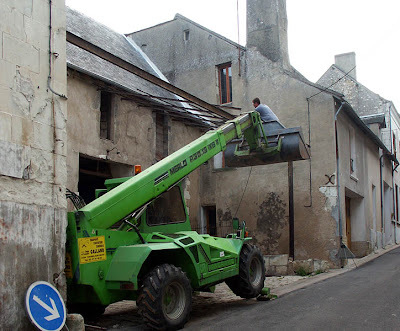 I don't think he quite believed me about house removals in Australia - that is, putting a house on the back of a truck and carting it off somewhere else. At some stage he will have to be shown photos. A good night's sleep in a comfortable bed meant that I was able to cope with the advent of telephone engineer in French. They are no different to Australian Telecom engineers - lots of swearing under the breath and shaking of heads. 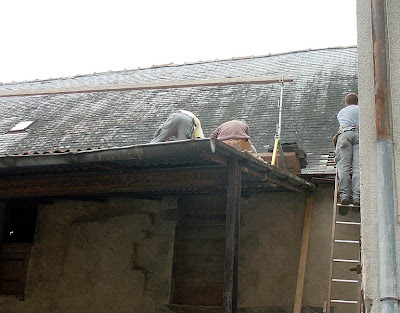 Still going with the roofing. 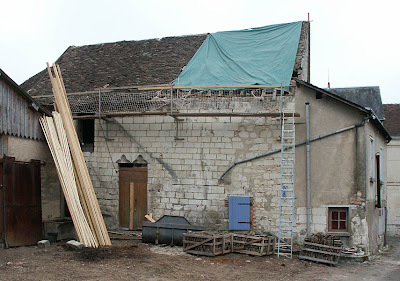 Work has now started on the back of the barn (the tiled section). The wood there is not in great condition, so has had to have a lot of work. As ever, pics when I get home. 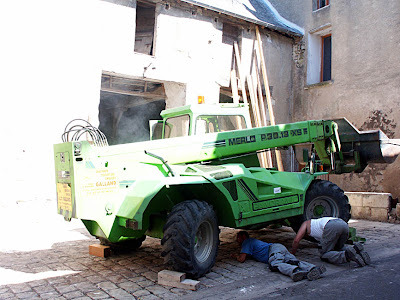 Yesterday the roofing team arrived back from lunch in the big green digger they have been using as scaffolding. Unfortunately, the diff was on fire, sending clouds of smoke into the air and causing a stench. Pics will follow in 10 days time. 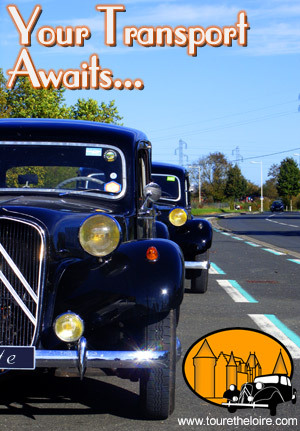 On a less dramatic front, we will soon (Tuesday) have a telephone. 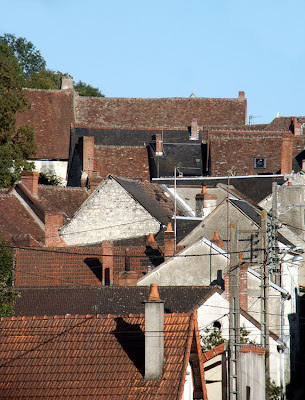 I went into Chatellerault on Thursday and arranged it all. Compared to EDF, it was painless. Talking of whom..... We should have electricity on Wednesday. Hopefully they will also fit a couple of plugs (prises) so we can use it. We also have no chimneys now. 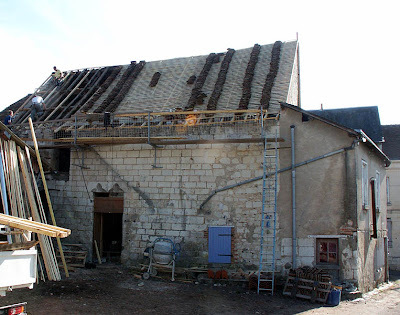 The second chimney (the one at the back of the house)has been demolished. Unfortunately, this was done while I was at the hardware store, so I arrived home to find the whole of the inside of the house covered in a couple of millimetres of oily soot where it had come down the hole for the range hood. It took me hours to clean up, because everything was black and sticky. EDF are the French electricity company. I don't know if they are a monopoly, but they sure act like one. After 3 days of getting recorded messages I girded up my loins and went to find the office. It wasn't in Descartes, as I was told, but in Loches. By the time I made Loches (via Descartes) it was almost lunchtime. I don't know if the man I saw at EDF had one eye on the clock, but he didnt want to help. No Way. Pas Possible. He did, however, print out a copy of an email (which had been sent to a wrong address) asking for details. No indication of the address to reply to, however. Luckily, it is Wednesday, and the Bibliotech and Espace Multimedia is open - so with an element of guesswork and some internet research I was able to glean an adress to which I posted my details. When I arrived home, I rang EDF again a couple of times, and then hey Presto - I was through!! I now have an appointment with EDF on next Wednesday to establish supply. 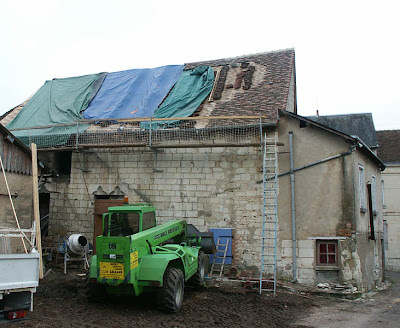 I arrived back in Preuilly on Monday afternoon to discover that the metal sheeting had been removed from the "hangar". 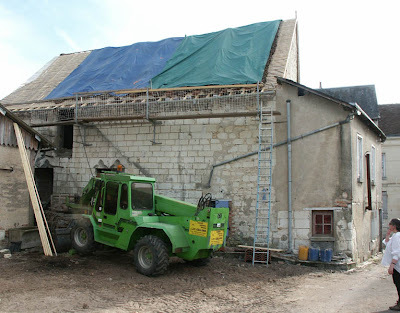 By the end of Tuesday the hangar was completely demolished, as was the old stone chimney (which was rotten). Apparently the boulangerie at the bottom of the main street (next to Petit Casino) has closed. This was sudden and unexpected- on Friday morning it just didn't open. My sources say that it has been sold, and will reopen in a couple of weeks. I feel a tinge of guilt, as I have been buying fewer treats for myself than in the past. More windows and other stuff. 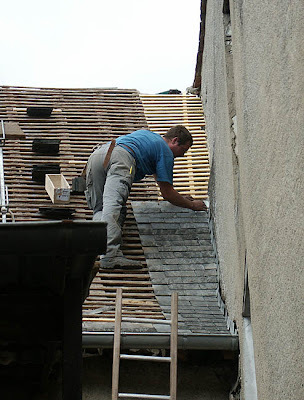 The roofers weren't the only people busy in Preuilly last week. 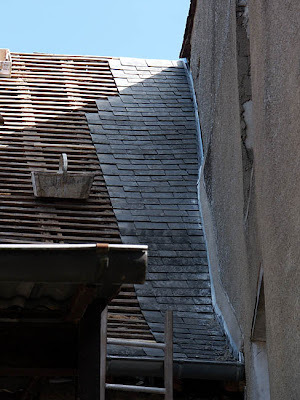 I decided that finding a glazier just to put glass in window frames was too big a task for my French for too small a job, so I measured the windows and went to Bricomarche in Chatellerault. There the 9 panes of glass were cut to the size needed and wrapped nicely in brown paper - all for 23€. I also bought a big tub (2.5kg) of linseed based window putty and a box of glazing nails. Surprisingly, reglazing windows isn't as traumatic as I first suspected. I managed to get all 9 pieces of glass into the frames without breaking anything. The only slight problem I had (apart from the sheer worry of nailing glass to wood) was one of the glazing bars had completely rotted. I chiselled out the guilty party and replaced with a new glazing bar I made myself. Easy!! 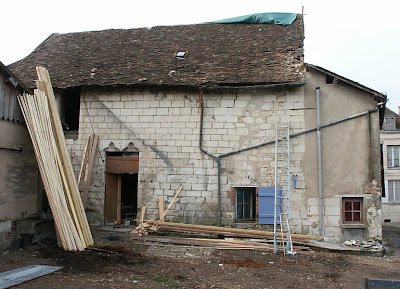 Once the windows were done, the next task tackled was removing various forms of wall cladding from the house. 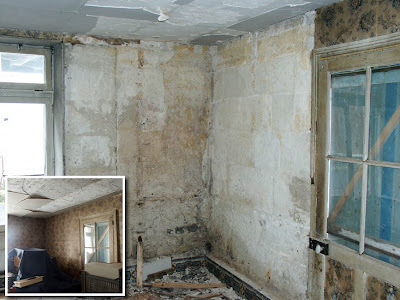 The front room (lounge, sitting room or salon) has nasty wallpapered chipboard nailed into battens that have been nailed into the stone. This made a satisfying mess and huge cloud of dust when removed, but I now have a large pile of rotting wood and slightly damp hardboard in the middle of the room. Next stage is to get rid of it - buying a trailer may be fairly high on the list. 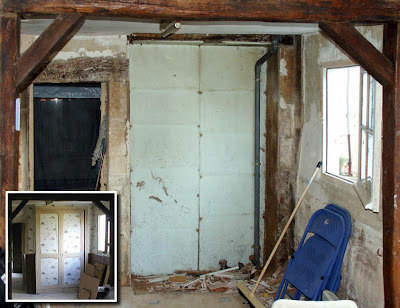 The front room - then (insert) and now. In the kitchen area we had an inbuilt cupboard with decidedly manky attributes. The door wouldnt work either. This was removed during the course of a quiet (until then!) evening listening to the cricket. 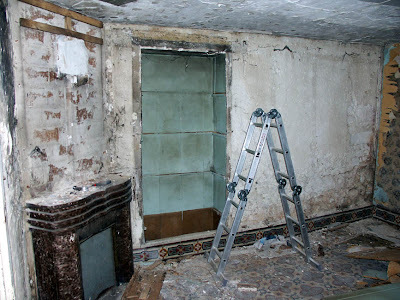 I also started work on removing the cladding from the walls of what will eventually become the utilities room/wc. 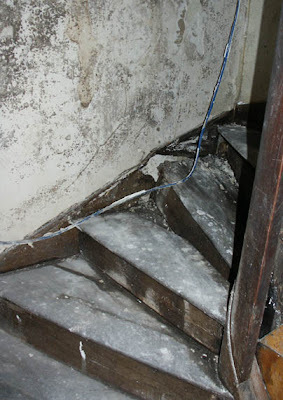 This is plaster board backed with 6cm (about 2½ inches) of expanded polystyrene. 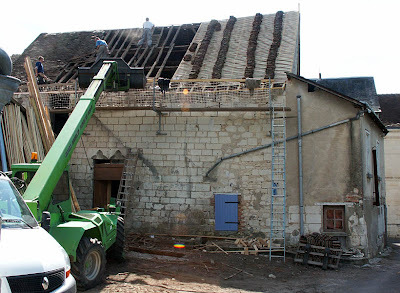 The board is glued with large dollops of "mastic" (it's all mastic in France) directly to the walls. 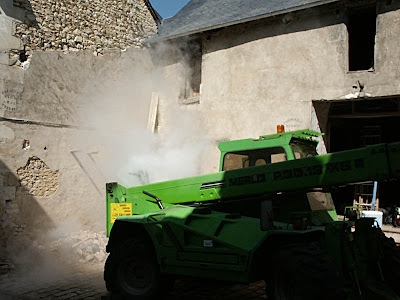 Unfortunately, in our case, the walls were skinned with particularly hard concrete in the past, so this had to be chipped off the delicate limestone blocks too. 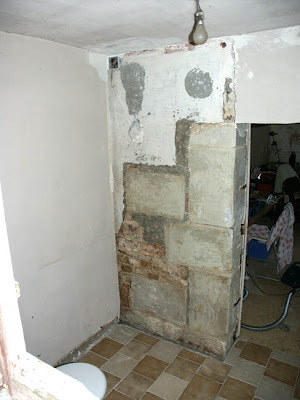 Yet more mess!Eventually I think we will be leaving the large blocks exposed, and plastering over the dodgy looking brickwork. As promised, some pictures. 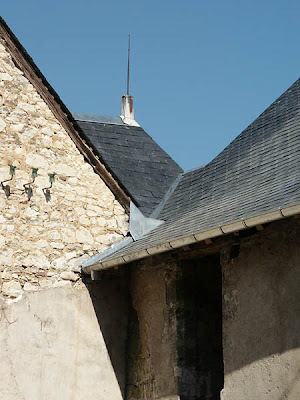 It's a little difficult to see what has happened because the metal roof is in the way - when I left for a weekend in London on Thurday morning, they had completed the guttering on the front of the granary, replaced about half the slates, with 1/4 off and 1/4 yet to come off. The flashing against the neighbour's wall has also been replaced. The mortaring is complete, and tiles are being replaced at pace. Thursday morning. the roof as it was when I left Preuilly. The weather has been brilliant - a bit chilly at night, but lovely sunny days. There have been one or two evenings where it has clouded over, and on Monday evening there was even some rain. If the weather keeps up like this we should finish on schedule (touch wood, fingers crossed, and all that) in three weeks time. 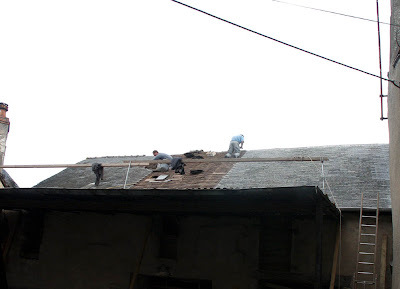 As promised, the roofers started work on Monday. 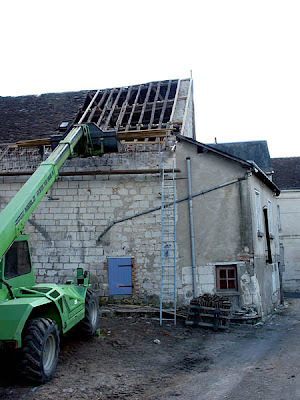 Insteqd of demolishing the "hangar" ( the tin roof in front of the granary) the started on the granary roof itself. there is method in their madness, however. 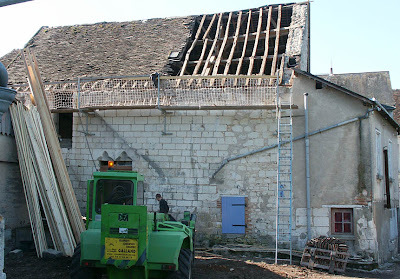 They need to get a gutter on the barn before the remove the hangar, otherwise the rain will just pour down the granary wall. Once they have done that, then they will demolish the hangar. 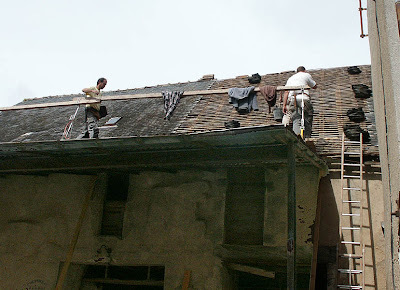 THEN they will start on the hole in the roof above the stairs, which is the most pressing ( to my eyes, qnyway) part of the job. While the roofers were roofing, I was demolishing bits of the house. Photos will follow; I am even getting the hang of French keyboards. 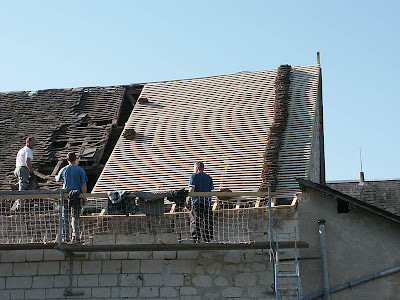 On arrival back in France I called in to the Philosophical Roofers to get qn update on the roof. Mondqy at 08.00. For sure. Or Tuesdqy. Since then Susan has had a voicemail saying that it's a Mondqy start. 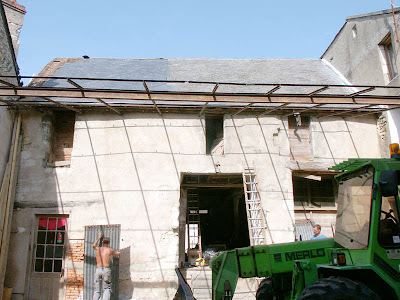 No photos, but next post should have evidence of demolition of the metal "hangar" at the front of the granary. In the meqntime I have been doing windows, including doing my first piece of glazing. I love the way handbooks just say "hammer the pins in flush with the glass" It worked though. For those who can't read the code, it helps to know that French Keyboards are qll messed up.